It may sound a bit weird, but I have grown fond of this particular bike. 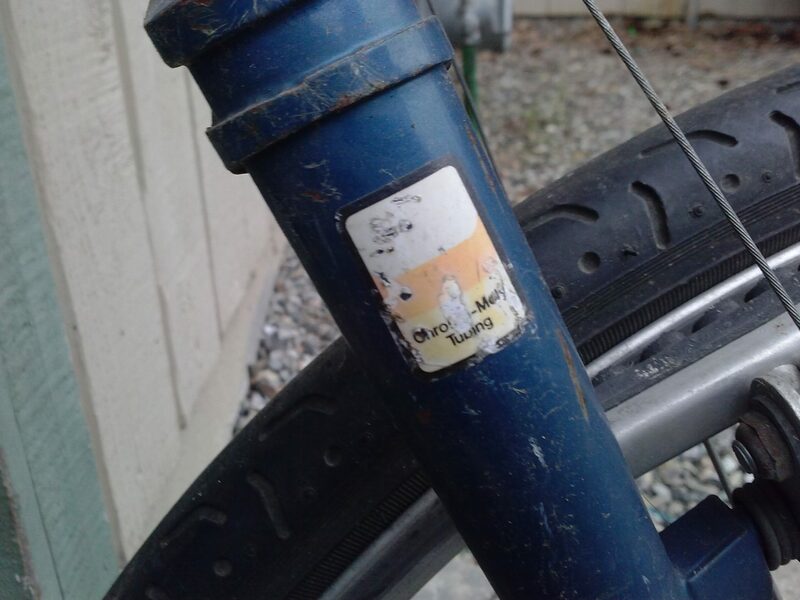 That’s because finding it really marked the beginning of me getting myself back into riding bikes, rather than periodically just moving them from one side of the garage to the other. My “go to” bike for the last few decades had been a mid/late 90’s Stumpjumper with a ubiquitous beige Judy XC fork. It is a wonderfully light M2 framed bike that at the time was really really expensive. However, I could make an argument that it was cost effective per mile because through the years I have literally ridden it thousands of miles. To be fair, those miles did take a toll on my M2, in that I have ridden/beaten it to death several times over. But like a certain disturbed doctor, I have also dug up and replaced nearly every part on that Frankenstein bike in an effort to keep it alive. 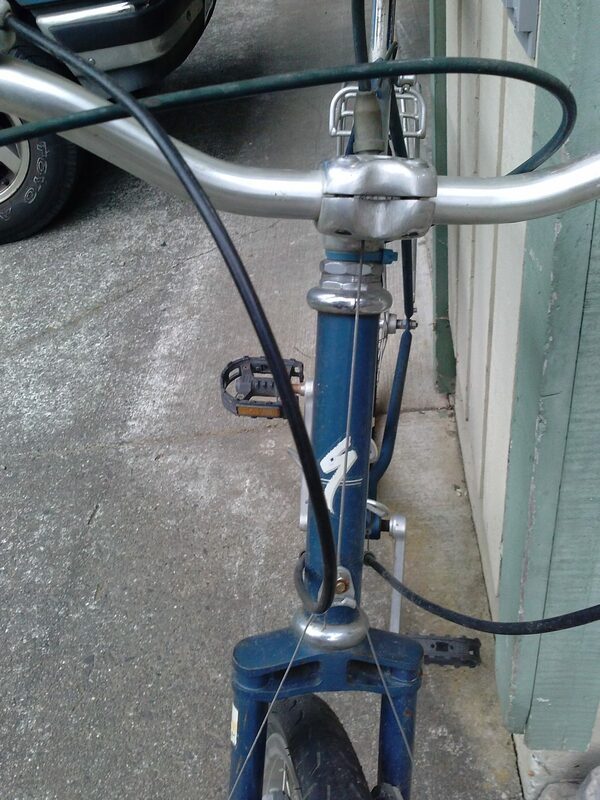 Today, It is still alive and well, but more important to my story, my Frankenstein bike is colored blue. So, several years ago my wife and I stopped in at a garage sale here in Ferndale during an annual community garage sale weekend. I spotted a couple of bikes for sale, but they were both in pretty poor shape, in need of tubes, tires, chains, pedals, and likely all new bearings. 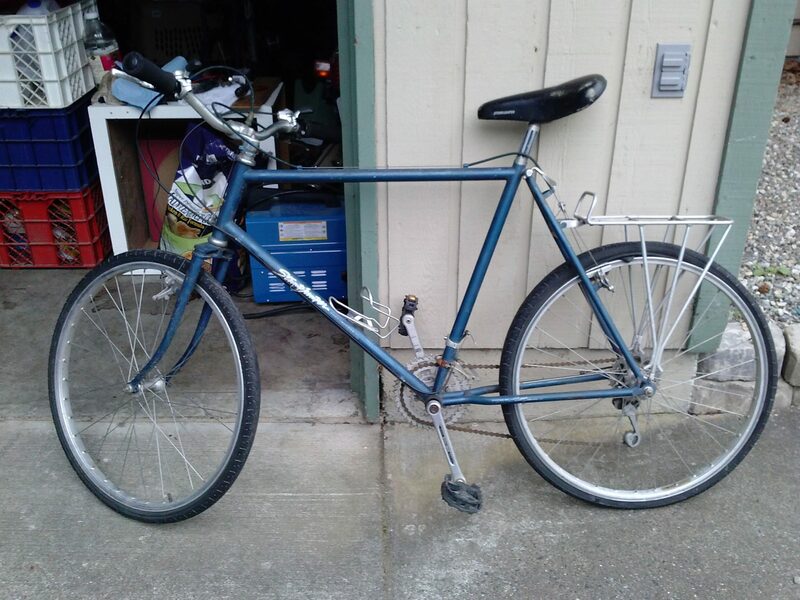 I wasn’t looking for a bike project so I initially passed on the $15 price tags. 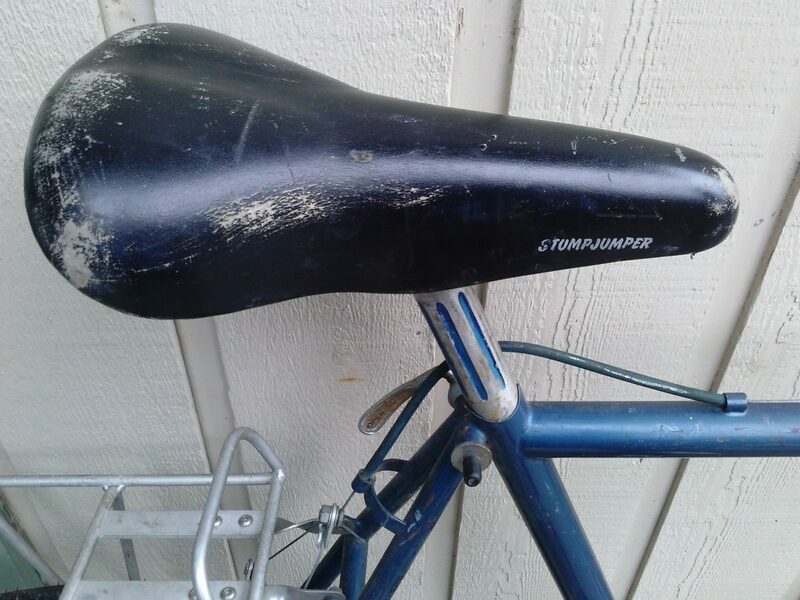 Later I took another look at them and noticed that one of them was an older Specialized Stumpjumper and it was blue, blue like my Frankenstein bike. I don’t know if it was garage sale fever or Karma that had me offering $10 for the blue bike, but they took my money so I became the proud owner of the blue basket case Stumpjumper and the sellers were happy not to haul it to the dump. We took it home where I did a little Googling to see just what I had gotten myself into. Here’s what I Facebook’d that day. 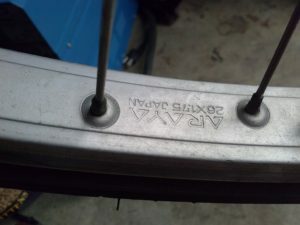 Way back in 1981 a little company made a big gamble when they designed a fat tire bike for offroad riding. They built a couple hundred “Mountain Bikes” in that first preproduction run and as it turns out they sold like hotcakes. Now, thirty years later, nearly every bike sold is a mountain bike. 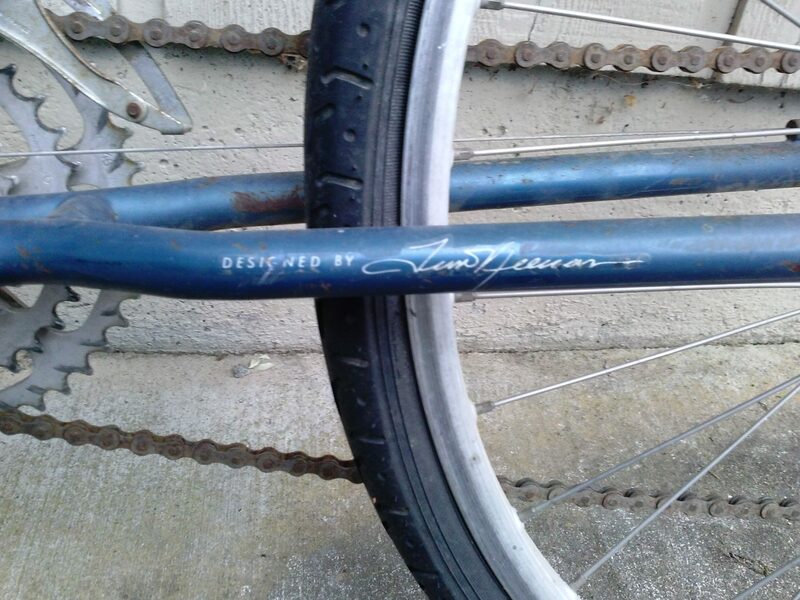 One of those first preproduction Stumpjumper mountain bikes is now on display in the Smithsonian and oddly, another was recently purchased by myself during Ferndale’s garage sale day for $10. A little tlc and a changout from those street tires and I’ll have a unique classic. 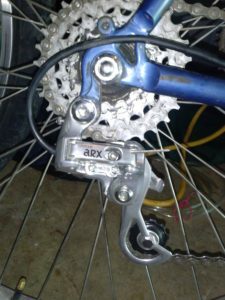 Maybe original pedals, maybe not. 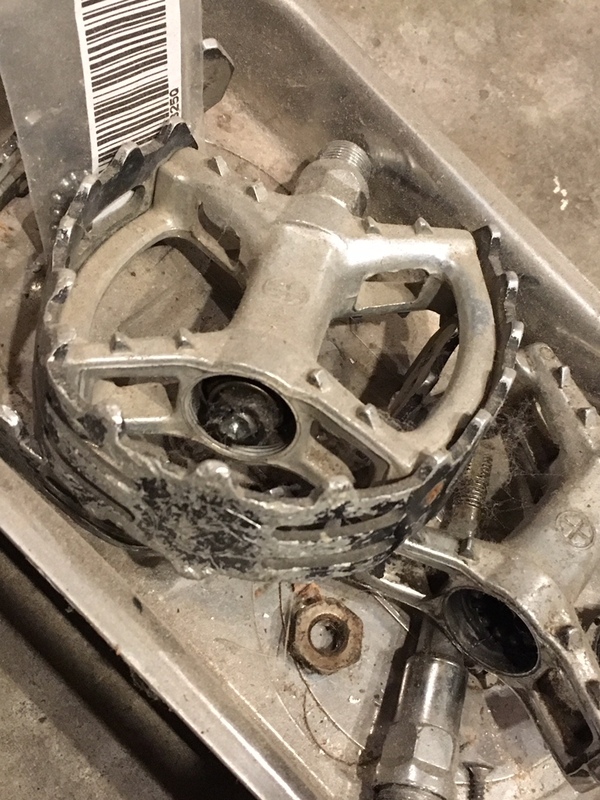 Before riding that early Stumpjumper much, I did have to do some maintenance, a bit more than TLC as it turned out. I did change out those street tires, as well as cleaned and repacked bearings in both wheels, the headset and the bottom bracket. 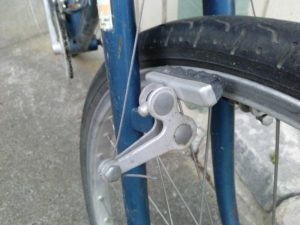 I’m guessing that the bike also had been upgraded sometime in the 80’s to Shimano Deore shifters and gears. I felt like original was the way to respect this bike, so I went into a holding pattern on the restoration until I could hunt up the correct parts on Ebay. 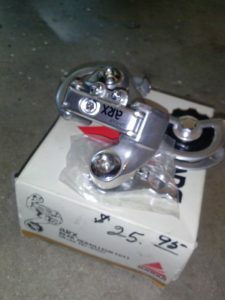 In this case, the originals were huge Suntour non-indexed thumbshifters pulling on Suntour derailleurs. 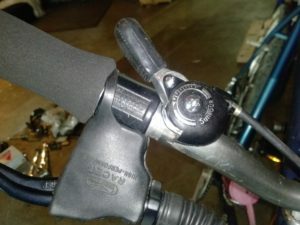 I also had to repair/replace the jumbo size Tommaselli Racer brake levers. And the oval BMX pedals appeared original, but in need of rebuilding, I still haven’t done them yet. Also new cables all around and i was off riding. I started with a lot of short loops that weren’t too far of a walk home should the old bike fail. Failure didn’t happen and riding became more pleasant as I got things adjusted properly and a few kinks worked out. The riding position would be totally foreign to a younger rider, it’s just not the same as any mountain bike from say, the last 20 years. The bike is sized correctly, but you just seemed perched up there on a touring bike rather than the feel of being in a cockpit like my later full-suspension Stumpjumper model. After many miles of shakedown, I felt the bike and I were ready to attempt something a little more mountain bikish. It happened to be pouring rain on the morning that I took us up the Ridge trail on Galbraith. At the top of the climb I turned left on the Family Fun Center trail and immediately got a reminder of just how poor brakes used to be, especially wet old brakes. This trail begins with an extremely mild downhill through trees with various roots and rocks. This trail is a bunny trail, but it became challenging rather quickly when you factored in the lack of braking. After some mental adjustment to a marginal/plan ahead braking, no suspension style of riding, the panic passed and I started to have fun picking my way through obstacles. The next challenge on this ride was getting used to having 5 non-indexed gears rather than the 9-10 indexed gears that we are used to now. No more click-click-click to find the right pedaling speed. Nope, shifting this machine takes focus and nearly removing your hand completely off the bar to select the next gear, which you might miss because gears are not indexed. Like the lack of brakes though, I adjusted my head a bit and began to just enjoy the uniqueness of always seeming to be in the “wrong” gear. Things were pretty good riding through Cedar Dust, but turned bad as I had planned to ride down Upper Bob’s trail on the way out. 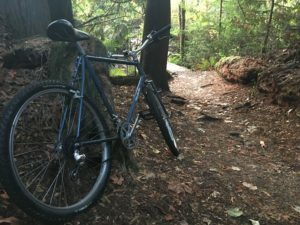 That was not a good plan on this bike because with some sections, planning ahead on braking did not matter because the steepness of the trail and the rain meant that I could not stop, not at all, no stopping period. Luckily not period end of story, because we have some really soft brush and ferns lining many of our trails up here in the Northwest. I used some of those ferns to bolster my braking power by riding off trail to an abrupt stop, what some might call a crash. It really wasn’t a crash, but it was the end of me riding this bike down any hills of any sort that day. I had had enough and did a lot of walking on the ride back down the Ridge Trail to my car, where grabbed a coffee at Woods and drove home. In hindsight, the early Stumpjumper likely performed exactly as it did when new. It didn’t really fail, I did. I failed to realize just how much better bikes are today than they were in 1981. 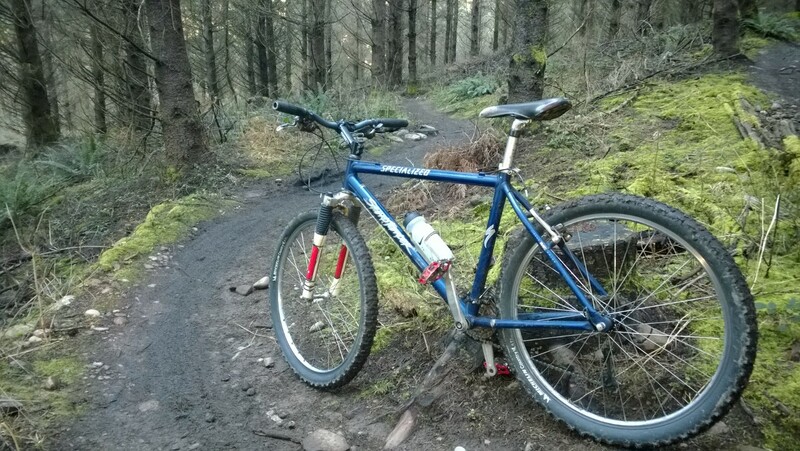 Sometime later, with dry trail conditions this time, I again took to the trails of Galbraith on this early Stumpjumper. This time I started with a gravel road ride/push up Galbraith Lane and on up to the towers. The ride up was rather nice on this entirely rigid bike. 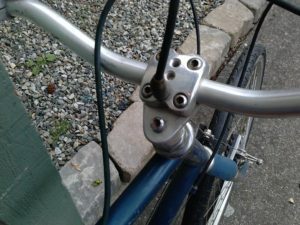 Gear shifting was a non-issue as I spent most time either in the lowest gear or pushing, just like the old days. My plan was to re-experience the brakes on the dry ride down from the tower and hit some trails along the way if the braking seemed promising. Dry braking was much improve over wet, not to the point of calling it good, or even OK, but it was enough to have me try some trials. I hit all three of the Pig Trails on the way down and thoroughly enjoyed the ride in those conditions where the brakes work, albeit marginally compared to discs or even V-brakes. I’ve repeated this ride several times in dry conditions, sometimes varying the trails, but always enjoying the retro-real experience. That was how I got my second and most interesting Stumpjumper. I now have five Stumpjumpers covering about 30 model years. The all are a bit different, rigid, hardtail, and full suspension, but they all just feel “right” to me when I ride them. 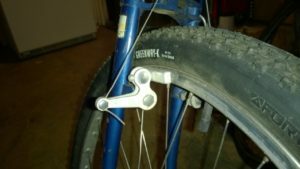 On this early Stumpjumper, I’ve fitted a set of Schwalbe Hurricane tires and the bike has settled in as my go to bike for recreational trails and easy pavement rides. Original Seat and Seat post. Looks like original cable housing as well. There isn’t a lot of concise information, but from poking around the internet I have come to believe that in late 1981 Specialized ordered up 500 preproduction bikes to be delivered in 250 piece lots. 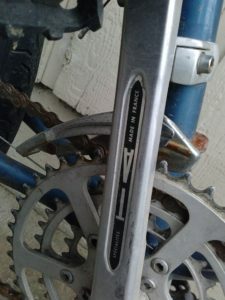 Looking at the serial number, decals, welded/not lugged frame, and bi-plane fork I believe my bike to be from the second lot of 250 bikes. What year is it? I’ve seen it called and ’81 and I’ve seen it called and ’82. 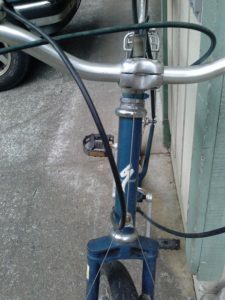 I’ve also seen ’82’s with lugged frames that look nothing like this bike. 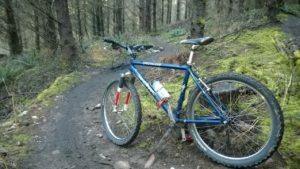 So I’ve decided it is a very early model Stumpjumper and just enjoy riding it.